Nature provides all beings sustenance, medicine, shelter and clothing. Our programmes reflect a concerted effort to develop more love for our earth and counteract global warming. Our initiatives include massive tree planting projects, growing saplings from seed, donating trees locally, zero waste management, recycling, creating the richest compost we know of, as well as environmental education for children, our future. Education does not change the world. Education changes people. Our dream is that our very accessible education programme spreads around the world, and that many, many schools adopt our philosophy through hands-on experience for children: planting and maintaining trees; the joys of gardening and taking the time to nurture vegetable patches and see them grow. How do we pronounce Green Sakthi? 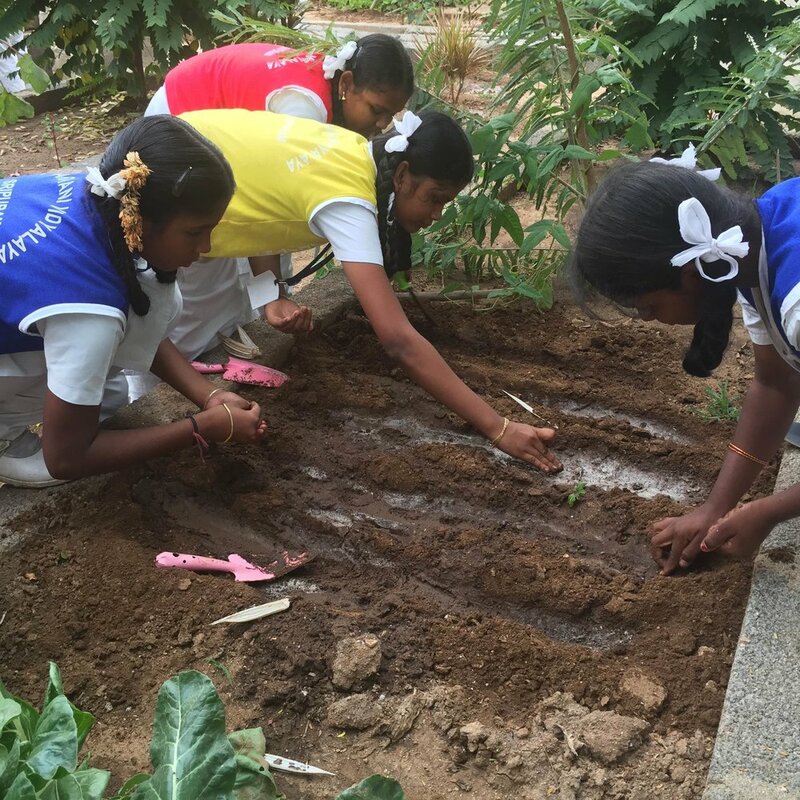 Try Shakti… in this part of the world SA is pronounced SHA… and THI is TI..
Green Sakthi Club is an opportunity for children to get their hands dirty and take responsibility in caring for the delightful nature which grows on their campus. 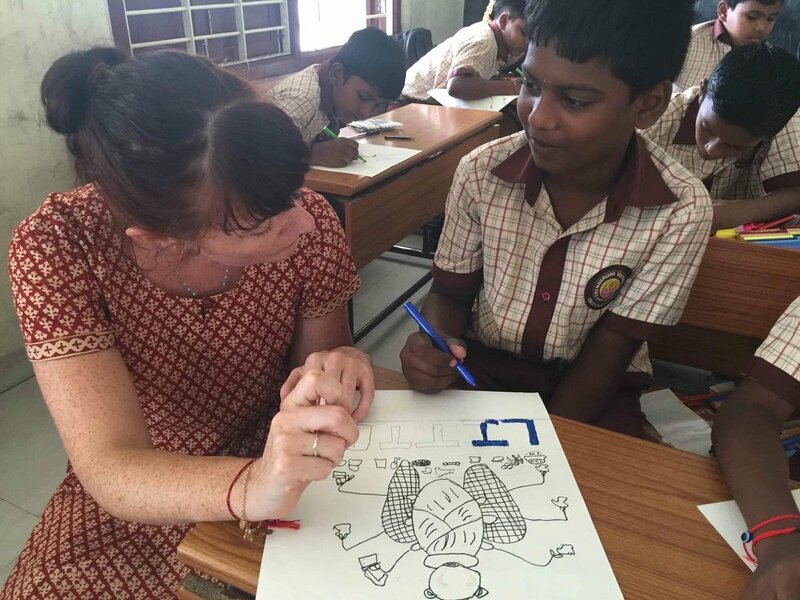 We welcome artists from around the world to share an art project with the students aged 9-13 years as a part of our Green Sakthi one month artist residency. Rebecca Dulaney, an artist from Dublin who lives in Paris ran a poster competition with our very enthusiastic students. Classes are from grades 5-8. Green Sakthi Club happens 4 days a week. Volunteers from overseas run the classes with the presence of a class teacher. Our students have a natural enthusiasm for the Green Sakthi Club, so we hold awards to encourage students to do their best. We offer awards for art competitions, cleanest classroom, most litter collected, and most cared for patch of school. In 2000, Green Sakthi's first large scale partnership programme began – a mass afforestation project in the sacred Kailash Giri Hills behind Sri Narayani Peedam. Together with the Tamil Nadu State Forestry Department, 100 000 trees were planted annually, reaching 700 000 trees over a period of seven years. All the saplings were raised from seeds in the Green Sakthi Tree Nursery (right). Green Sakthi Nursery - all saplings planted start from seed and are nurtured here. All biodegradable including : banana leaves (we serve meals on), food waste from the dining areas, ingredients left over from temple poojas, flower garlands, cow dung and urine (direct from our cow shed — the mixture of dung and uring neutralises the odour) are collected, and slowly breaks down under the hot sun for three months. Second phase is moved into the vermicomposting shed, where worms bred on site, break down the compost even further for another three months. Finally, the compost is sifted and packed into bags. This compost, known as ‘black gold’, is sold at the temple and used in the campus gardens, afforestation areas and tree nursery. After 3 months under the hot sun, the biodegradable mulch is moved into the shed to be broken down by worms over the next 3 months. After having completed our Solar Kitchen fundraiser last year, the Sripuram solar kitchen is presently under construction! The power of the sun will power enough meals to feed 5000 visitors for no cost every day. It’s going to be delicious ! We will keep you posted on how the surplus sun-power will be used. Why is it important to have a solar kitchen? When the physical body feels hunger, the mind and soul get disturbed. When you feed a person, they will feel satisfied and happy. When the body is satisfied, the soul is satisfied. It is only by feeding a person that one can truly satisfy them. No other form of charity can do this. When someone else is happy, you will also feel happy because we all come from the same Divine Ocean. Jumping for Joy - the solar dishes have been installed! Sripuram Anna Dhanam solar kitchen under construction. 5000 meals will be offered at no costs to visitors everyday.